“Sao Paulo” was inspired by a trip to Brazil several years ago that I undertook to give some clinics and concerts. It was a great experience and I loved the people, music, and food. “Alpine Sunset” was written after a trip to Switzerland that my wife Pam and I took. The photo on the cover of this recording was taken from our chalet where we were staying in Interlaken, Switzerland. We traveled by train to the summit of Jungfrau which is the mountain on the right shown in the photo. Needless to say, it was an awe inspiring experience. 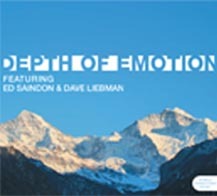 Depth of Emotion is currently available for purchase from Amazon, CD Baby and ITunes.